Justin Thomas is making his first start in two weeks since he swept Hawaii after he won the SBS Tournament of Champions at Kapalua by three strokes and the Sony Open by seven. In the Sony Open, he forced his way into the sub 60 club, shooting a 59 in the opening round, and then went on to post the PGA Tour 72 hole low record (-27). Before that, he defended his 2015 title in the CIMB Classic in Malaysia in November by winning the tournament again by three strokes over Hideki Matsuyama. To make a long story short: Thomas has been far and away the best player on the planet this season. After cashing out in Hawaii, Thomas leads the FedEx Cup Standings and has risen to No. 8 in the Official World Golf Rankings, and he looks to continue his dominance when he tees off at the Waste Management Phoenix Open at TPC Scottsdale. The 23-year-old and 2011 St.X graduate will make his third start in the event. Last year, Thomas missed the cut, however, he finished T-17th in 2015. The expectations will be much higher this year, and many fans, especially Tiger Nation, will be tracking his every move. Thomas will be paired with Phil Mickelson and Adam Hadwin in Round 1 and they will tee off tomorrow at 3:07 P.M. Other golfers to watch at the event will be Hideki Matsuyama, Matt Kuchar, Rickie Folwer, Bubba Watson, Jordan Spieth, and Farmers Insurance winner Jon Rahm. You can follow Thomas’ progress on the Golf Channel, and I’ll try to give as many updates as I can on Twitter. Good Luck to our man JT! Justin Thomas is competing in this week’s Greenbrier Classic in White Suplhur Springs, WV. The Former Tiger hit a hole in one on Thursday and has stayed near the top of the leaderboard since. For the final round of the tournament, we will give you hole by hole updates on how Justin is doing out on the links. A top 12 finish will get him a trip to St. Andrews for The Open, but let’s go get this win, JT! The first one starts the dominoes for many more to come. 1 (Par 4) – Birdie, moves to -11 and tied for the lead. 4 (Par4) – Birdie, Bryce Molder and Russell Henley birdie also and share the lead with Justin at -12. Henley is in the clubhouse now. 5 (Par 4) – Par, missed a 13 ft. birdie attempt just by a couple of inches and taps in to stay at -12 and tied for the lead. 6 (Par 4) – Par, CBS Final Round Live Coverage has begun on TV with Jim Nantz on the call. 8 (Par 3) – Birdie, Justin now has the outright lead at -13. 9 (Par 4) – Bogey, drops to tied for the lead at -12. That was Justin’s first bogey in a 29 hole stretch. 10 (Par 4) – Double Bogey, drops to -10 and two back from leaders Henley and Kisner. 12 (Par 5) – Par, Justin misses birdie attempt and sits three back from leaders now. 13 (Par 4) – Bogey, Falls to to -9 and 4 back from lead. 16 (Par 4) – Quadruple Bogey, Justin falls to -5 and 9 back from lead. For more #JustinTracker news, follow @WSTXSports and @PGATour on Twitter. Justin Thomas Hits a Hole In One! Our guy Justin Thomas made some new friends at The Greenbrier Classic today after he hit an ace on Hole 18, which resulted in the spectators at that hole winning $500 a piece! The prize was paid out by The Greenbrier’s owner, Jim Justice, to each crowd member. Justin’s hole in one was the second of the day and that means the next one will result in the crowd getting $1,000… how far away is The Greenbrier again?? This might be the worst idea for a promotion since Jackie Moon and the Flint Tropics said they would give away free corn dogs if they scored 125 points. Take a look at the big time hit from the Former Tiger before he made the turn to the back nine in his first round in West Virginia. Thomas is T27 at -3 after one day of play. He sits just five strokes off the leader, Scott Langley. Former Tiger Justin Thomas is playing in the AT&T Byron Nelson this weekend, and he happens to know the person he is paired with rather well. Thomas is paired with good friend and Masters Champion Jordan Spieth. 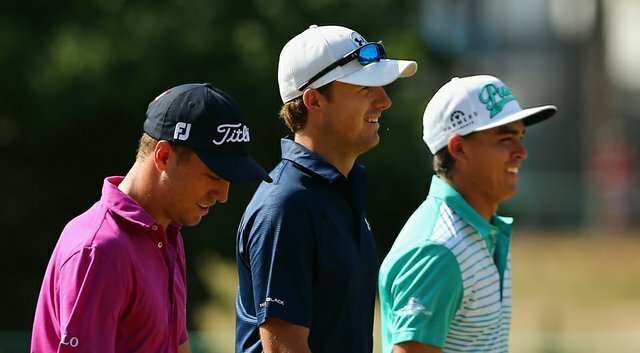 Thomas and Spieth are also paired with another young star, Brooks Koepka. Mike McAllister of PGATour.com went into more detail on the two being paired together for the first time in their professional careers. Thomas is one of just 18 players this season averaging better than 300 yards in driving distance, so he certainly has the length to deal with the 7,166-yard layout. Plus, he’s been knocking on the door during his rookie season, with five top-10 finishes. Considering that in the last five years, four of the AT&T Byron Nelson champs were first-time TOUR winners, projecting a Thomas win doesn’t seem like a stretch. Oh, and if it means anything, Thomas shot 9 under during Wednesday’s pro-am. Thomas said he would give himself a “B, B-minus” this year, but that grade would certainly go up with a victory. Perhaps some of Spieth’s magic this season will rub off on his good friend. Read more about the pairing here. Also check out Thomas’ interview and highlights so far at the AT&T Byron Nelson by clicking the picture below or going to this link here. Justin Thomas did Justin Thomas things this weekend, as he finished tied for 7th at the Wells Fargo Championship. He shot a 2-under par in his final round to finish at -11 for the tournament. He had another great “Moving Day” this weekend, as he shot a 65 on Saturday. His 3rd round was headlined by two eagles on holes 5 and 7. He didn’t use up all of his eagles on Saturday though. He putted in another eagle yesterday. The PGA Tour twitter account tweeted out the awesome shot. Good morning, WSTX Sports readers and Tiger Golf fans and welcome to The Players Championship LIVE DIARY on WSTXSports.com. This will be a running diary of this weekend’s Players Championship PGA Tour Event featuring our own Justin Thomas in Jacksonville, FL. It has been a while since we have done one of these so let’s remind you of how this works! We will take you through the day with commentary of the scene with updates coming as often as possible. Refresh the page throughout the day to follow along. Tweet us questions at @WSTXSports or have fun and be a part of the conversation in the comment section below! Go Tigers! (7:36 AM) Justin Thomas will be teeing off momentarily from TPC Sawgrass from Hole 10 with his partners for the first two rounds, Daniel Summerhays and Michael Putnam. Good luck, Justin! (12:00 PM) Thomas is +1 thru 16* at The Players. He had only one bogey on 11, which is the only hole he didn’t shoot par. He sits at T42 at the moment, but only 6 strokes off the lead. The next hole for Thomas is the toughest in golf. The island at TPC Sawgrass is known for being one of the most difficult in the game. Let’s hope he lives up to the stamp he and Jordan Spieth got on their wedges. Non Splash Brothers. (5:40 PM) Justin finished at +1 for the First Round of The Players at TPC Sawgrass. That’s good for T81, but still only 6 strokes off the lead. Plenty of golf is still to be played and slots are there to be moved up on the leaderboard. Tomorrow afternoon, Thomas will tee off at 12:46 PM in the Second Round. We’ll be back with more updates tomorrow! For now, Go St. X… Beat The Weeds! (12:13 PM) This morning, before Justin tees off in the second round of The Players, he took to Twitter to congratulate Tiger Golf’s Allen Hamilton on his commitment to Kentucky. Very cool to see the pro giving props to the rising senior. Hamilton will join Thomas as a Former Tiger that has gone on to play in the SEC when his time at St. X is finished. The projected cut is looking to be at E for the tournament with so many golfers in the red after the first round. Justin will have to put together a nice outing today to continue on to tomorrow. We know he’s more than capable of coming through with a big day. Now that he’s felt out the course a little bit, it’s time for him to make a move. You can watch the second round of The Players live on Golf Channel from 1:00-7:00 PM today. (6:24 PM) Justin Thomas is in the clubhouse after he had a great second round, shooting a 70 to bring him to -1 overall for the tournament. The projected cut is E like we said this morning, so Justin looks to have played him into the weekend at The Players. Congratulations to the Former Tiger! It’s almost not even a big deal to see him making the cut on the tour. Still a great accomplishment and especially this weekend in a tournament such as The Players. (11:53 PM) So this just happened. Justin Thomas hit his tee shot on the 8th straight into a fans’ cup holder. Hole in one? (8:00 PM) The Tiger Sports world had an unbelievable day as Tennis clinched a spot in the state semifinals, Rugby crushed their opponent and Volleyball went 3-1, but the most impressive performance had to have came from Former Tiger Justin Thomas. Thomas posted an incredible 65 in the third round of The Players. For the first time in the history of TPC Sawgrass, a 10 birdie day was posted… yep, by Justin! Over 14,000 rounds have been played at one of the toughest courses in the country and the 22 year old rookie was the first to accomplish that feat. Thomas moves to -8 overall in the tournament, which puts him tied for 5th. At one point before the leaders teed off, he was tied for the lead. Golf experts call Saturday, moving day and Justin certainly moved in the right direction. If he can duplicate today’s performance or even come close to it, he’ll have a chance to bring home his first PGA Tour win. (10:52 PM) Good morning and Happy Mother’s Day to Tiger Nation! Justin Thomas has been paired with Sergio Garcia for the Final Round of The Players today and they will tee off at 2:15 PM from TPC Sawgrass. Thomas is two shots off the lead entering the last day and has a legitimate shot to bring home the hardware (and huge check) later on today! Good luck Justin! (2:47 PM) Justin Thomas just birdied the second hole and is now one shot off the lead. The Golf Channel analysts broke down who stood out on the leaderboard heading into the final round. Click on the picture below to listen in on what they had to say about our own Justin Thomas. (2:54 PM) Thomas bogeys the third hole to move back to -8 and two shots off the lead at The Players. Ben Martin and Chris Kirk are tied at -10 for the lead at the moment. Justin heads to the fourth at TPC Sawgrass. Five years after playing in a AJGA event in Jacksonville at TPC Sawgrass, Justin Thomas will return to participate in the 2015 Players Championship. Note: the picture above is when Justin was 13, not 5 years ago, but he still was a youngin last time he played this course and a St. X student still. The Players Championship is one of the biggest golf events of the year and will feature all the big time players like Tiger, Phil and Rory and of course our own Justin Thomas. The tournament will get underway on Thursday and we will keep you updated on how the Former Tiger fairs down in Jacksonville all weekend long. Former Tiger Justin Thomas is in his first major, and he has been getting a ton of attention from national media. The latest media outlet to take a look at Thomas was Fox Sports. They dive into Justin Thomas and Jordan Spieth’s friendship along with Justin Thomas’ relationship with Spieth’s caddie. Thomas and Spieth have known each other since 2007, when they battled all summer on the junior circuit and were selected to represent the United States in the Evian Junior Masters in France. Thomas won the 36-hole event, and his reward was to play the Evian Masters pro-am with Juli Inkster. Spieth caddied for him. They have been close friends ever since, and the needle in their playful banter is sharp. Former Tiger Justin Thomas qualified for the US Open for the first time in his career, and his week got a little better on Tuesday at the practice round. Thomas and his partner Jordan Spieth defeated Mickelson, one of the favorites to win the US Open, and Fowler by 1 in a friendly match. Thomas had an easy choice of a partner, as he picked his long time friend in Jordan Spieth. They have known each other since they were 14 when they met at the 2008 Evian Masters Junior Cup. Mickelson usually plays with the likes of Keegan Bradley and Dustin Johnson during his practice rounds, but Mickelson doesn’t mind playing with young guys. “What it does for me is it allows me to see what’s coming up, and it pushes me to work harder,” Mickelson said. Former Tiger Justin Thomas has qualified for the 2014 U.S. Open. This will be Thomas’ first major tournament when he hits the links at Pinehurst Resort and Country Club from June 12-15. As an amateur, Thomas missed the field a year ago by one shot after finishing his round with a pair of bogeys. This year, he ended with a par to stay at 5-under in the Columbus, Ohio, qualifier. Thomas, now a full-time player on the developmental Web.com Tour, is seventh through nine events played in earnings with $162,798. He’s finished as high as second in the El Bosque Mexico Championship in April and missed just one cut. Upon returning from his outing in the Web.com Tour’s Chile Classic, Former Tiger Justin Thomas joined his teammates from his collegiate golf days in the nation’s capital, Washington D.C., to celebrate their team’s NCAA National Championship they won last year. “My passport is getting pretty stamped up,” said Thomas, who was in Colombia for the Web.com Tour opener three weeks ago and is headed to Panama on Sunday. But the whirlwind day was well worth it for Thomas, who turned pro last spring after his sophomore year. With his teammates from the 2012-13 season, he reunited in the nation’s capital for a visit to the White House to celebrate the school’s first national championship in men’s golf. “I was just sitting there thinking, ‘With all of those teams there, there’s only one men’s golf program. And that’s us, because we were the best team in college golf last year,’ ” Thomas said. “I am getting goosebumps talking about it now. Always great to have a St. Xavier grad in The White House! Very cool opportunity for one of our own!